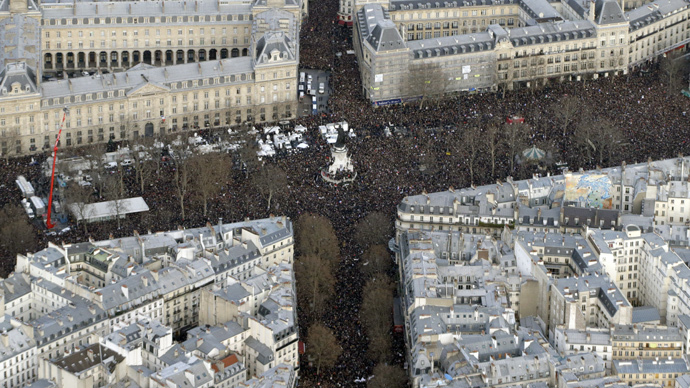 Up to three million, according to local media estimates, are marching through Paris in solidarity with the 17 victims of the Charlie Hebdo attack and the three-day-long period of terror attacks. Over 40 world leaders joined the “cry for freedom” rally. "Fantastic France! I am told there could be as many as 1.3 million to 1.5 million of us in Paris," Francois Lamy, the rally's Socialist Party organizer, tweeted. France’s Interior Ministry called the rally “unprecedented”, adding that the numbers were impossible to properly count because people veered off the officially stated route. However, French media put the number as high as 3 million, with some suggesting that there hasn’t been a march of the same level since Paris was freed from the Nazis in WW2. The world leaders, among them German Chancellor Angela Merkel, Israeli Prime Minister Benjamin Netanyahu, and Russian Foreign Minister Sergey Lavrov, passed in silence through one of the main streets in Paris. The march began at Place de la Republiqueand headed towards Place de la Nation, approximately three kilometers away. The relatives of the victims who were killed in the attacks headed another rally. Security measures, in the light of recent events, have been extremely thorough, with some 2,200 security personnel watching over the route of the march. “Speaking to some of the hundreds of thousands of demonstrators who have descended on Place de la Nation here in central Paris today, really two almost distinct sets of sentiments and messages are being expressed,” RT’s Harry Fear said from Paris. People also took to the streets in the northern cities of Orleans, Rouen, and Lille. However, the protests in support of #JeSuisCharlie spread worldwide. Some 12,000 rallied in Vienna in support of France, and people also took to the streets in Beirut. Twelve people, including four notable cartoonists, were killed in the first attack on Wednesday, and have since come to symbolize a non-violent fight for freedom of expression across France and the world. The global outcry of sorrow and condemnation followed three tense days, with the Twitter hashtag #JeSuisCharlie (‘I am Charlie’) gaining some of the widest popularity ever witnessed on the social network, with over five million reposts. On Thursday, a policewoman was gunned down in the French capital by a terrorist named Amedy Coulibaly. The man later took hostages in a kosher store in northeast Paris, killing four people on January 9. French police neutralized the Kouachi brothers and Coulibaly in two separate operations on Friday.